A vacation away on the Haliburton Highlands is always my favourite place to head out to where I can refresh my mind, similar to what Dr.Teals states about their product. 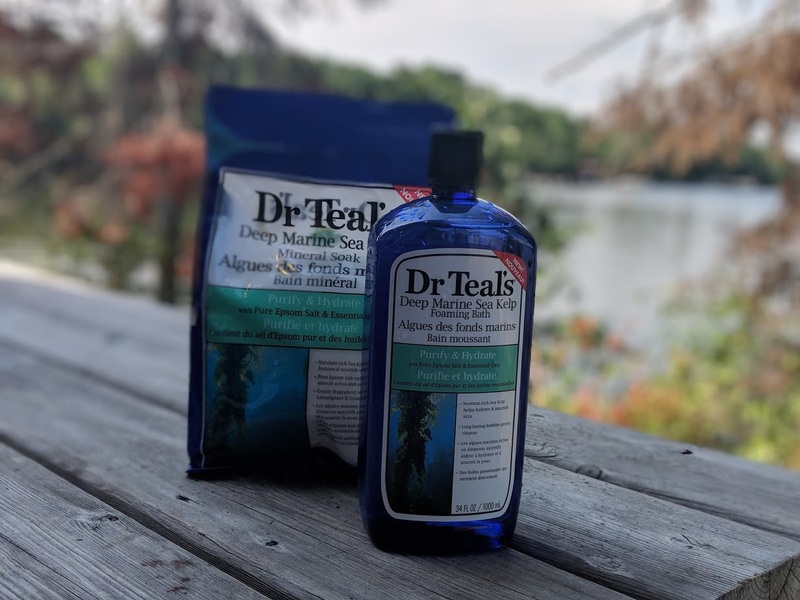 When I was sent their Dr.Teals Deep Marine Mineral Foaming bath and mineral soak, I thought I’d bring the ocean to the lake and you can win this bundle for yourself! After the drive, I got out of the minivan, took a much-needed stretch and unloaded the luggage. Kids were running around, the husband was trying to help and check in to our Inn/Cottage at the Red Umbrella Inn. 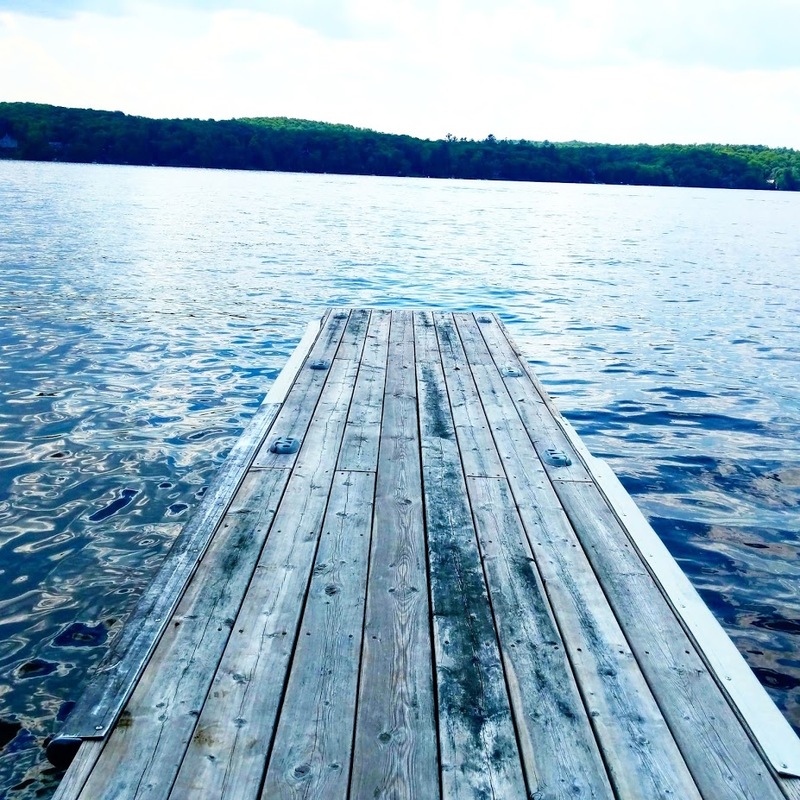 It was an action-packed weekend at the cottage from lots of dock jumping, tubing, hiking and more. I mean look at this dock! After dinner and enjoying the sun setting my husband took the kids to the main lodge so I could test this stuff out. Dr.Teals is exceptional quality and is priced very reasonably which is what I truly love about the line. I really wanted to be calm and still and 20 minutes is all I need. 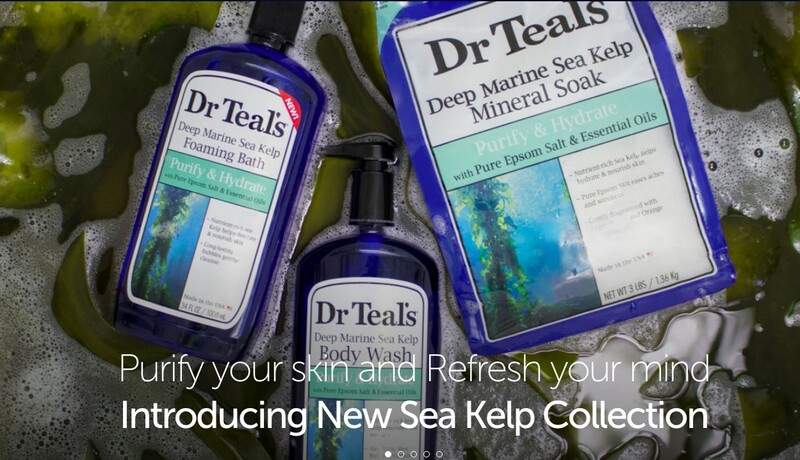 New from Dr.Teals is the Deep Marine Sea Kelp and Mineral Soak. This unique mineral soak blends Pure Epsom Salt, Sea Salt, Sea Kelp and moisturizing essential oils to ease aches and soreness and help hydrate skin. After the lake water and all that glorious sun, I needed the TLC. The Mineral Soak is infused with Lemongrass and Orange essential oils create a blissful soaking experience to soothe the senses and help provide relief from stress. It was fantastic! I even took it a step further and noticed my pedicure was looking a little worn on my heals. I used the sea salt and even the bubble bath to make a scrub/paste and massaged it into my feet. 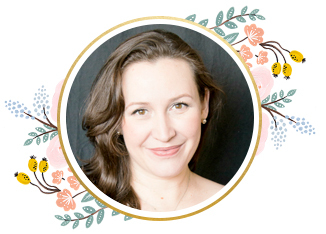 Using Dr.Teals is like bringing the spa home. Dr. Teal’s Sea Kelp Foaming Bath transforms your bath into a relaxing spa with essential oils to soothe the senses. The cottage smelled like the spa and I emerged from the bath feeling brand new. I felt relaxed, my skin felt good and I was ready to join the family in the main lodge. Where can you buy Dr.Teals? Walmart! But you can check out other retailers here. But you can also enter to win some Dr.Teals for yourself! Get the Deep Marine Sea Kelp and Mineral Soak and Dr.Teals Sea Kelp Foaming Bath. Bring the benefits of the ocean to the comfort of your own home. The Lavender is amazing too. If you see Dr.Teals at a retailer near you, I hope you’ll give it a try. With clean ingredients and quality essential oils, you’re going to love it. Giveaway is Canadian Only. 18+ yrs to enter and excludes Quebec. Giveaway ends Aug.14.18. Good Luck! Disclosure: This sponsored post is written in collaboration with Dr.Teals. All opinions are always my own. I would just love to try the foot soak!!! I would LOVE to try the Foot Scrub! love the Dr. Teals…its consistent. I would like to try the foot soak! I have rough feet. I would love the foot scrub. It sounds great for removing dead, rough skin. I would love to try the Foot Soak! I’d love to try the foot scrub. I would love to try the foot scrub. My feet could use some exfoliation. The Moisturizing Body Lotion sounds great ! I am outside a lot so a good body lotion is a must. I would like to try the foot soak and the body oil. I’d love to try this foaming bath, as well as the Epsom salt soak! I’d love to try the Foot Soak! I would love to try the Foot Soak, it sounds soothing! The foot soak sounds soothing. Would like to try the foot soak.